Forty years later, despite some tremendous gains, Parks feels, "we still have a long way to go in improving the race relations in this country." 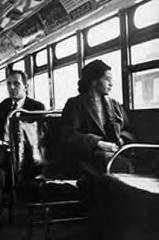 Rosa Parks spends most of her year in Detroit but winters in Los Angeles. Her day is filled with reading mail,-"from students, politicians, and just regular people"-preparing meals, going to church, and visiting people in hospitals. She is still active in fighting racial injustices, now standing up for what she believes in and sharing her message with others. She and other members of the Rosa and Raymond Parks Institute for Self-Development have a special program called Pathways to Freedom, for young people age 11-18. Children in the program travel across the country tracing the Underground Railroad, visiting the scenes of critical events in the civil rights movement and learning aspects of America's history. Says Elaine Steele, Parks' close friend and cofounder of the Rosa and Raymond Parks Institute for Self-Development, "Mrs. Parks is a role model that these students look up to, and they feel very honored and privileged to be in her company. And she's very gracious to accompany the students to these activities." February, Black History Month, seemed a relevant time to evaluate youth and their sense of history. But Parks thinks bigger and broader. "We don't have enough young people who are concerned and who are exposed to the civil rights movement, and I would like to see more exposure and get their interest," she says, pausing to reflect, "but I think it should just be history, period, and not thinking in terms of only Black History Month." Parks is quiet, soft-spoken, and diplomatic. But she is firm in her belief that enough people will have the courage and dedication to make this country better than it is. "And this young man that's taking over the NAACP, Kweisi Mfume, I admire him a great deal," she adds. About Louis Farrakhan, the leader of the Black Muslims, she says, "Well, I don't know him personally, but I think it was great that he spearheaded the million man march." Parks has met many renowned leaders and has traveled throughout the world receiving honors and awards for her efforts toward racial harmony. She is appreciative and honored by them but exhibits little emotion over whom she has met or what she has done. Her response to being called "the Mother of the Civil Rights Movement" is modest. "If people think of me in that way, I just accept the honor and appreciate it," she says. In Quiet Strength, however, Parks is careful to explain that she did not change things alone. "Four decades later I am still uncomfortable with the credit given to me for starting the bus boycott. I would like [people] to know I was not the only person involved. I was just one of many who fought for freedom." In August 1994, Parks was attacked in her home by a young man who wanted money from her. Of the event, she writes, "I pray for this young man and the conditions in our country that have made him this way. Despite the violence and crime in our society, we should not let fear overwhelm us. We must remain strong."